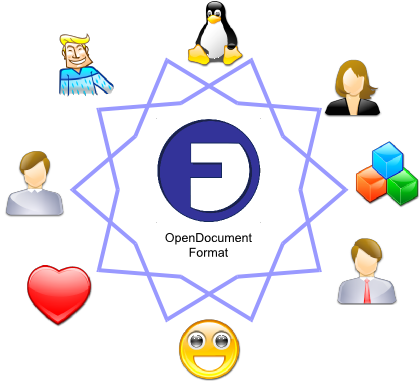 All about OpenDocument Format, its ecosystem and competition. O organismo padronizador daquele país aprovou o OOXML mesmo que grande parte de seu corpo técnico foi contra. Ou seja, rolou marmelada forte. Gostaria que eles respondesem a minha carta aberta aberta os NBs que votaram SIM. Aqui na IBM um funcionário troca de laptop mais ou menos a cada 4 anos. Minha última troca foi em novembro e recebi um ThinkPad T61 com CPU dual core, 2GB RAM e 120GB em disco. Uma maravilha de máquina. Em termos de software, o computador já veio com Windows XP Pro, Lotus Notes, MS Word+Excel+PowerPoint 2002 e outros softwares que funcionários usam no dia-a-dia. O funcionário pode optar por instalar Linux, reparticionando ou não, com suporte interno. Pode também instalar aplicativos pré-homologados e pré-customizados de um repositório interno que chamamos de ISSI. O Lotus Notes que usamos agora é a 8.0.1, que inclui o Symphony, suite de escritório baseado no OpenOffice.org e que nativamente lê e grava documentos no formato ODF (textos, planilhas e apresentações). Semana passada recebemos um comunicado interno dizendo que novos computadores não terão mais o MS Office instalado. Caso o funcionário precise, terá que justificar e disparar um pedido de compra. O Symphony é agora a suite de escritório oficial interna na IBM, globalmente. Significa também que o formato padrão de documentos é o ODF e formatos antigos como DOC, XLS são suportados como legado. Por enquanto acredito que muitas pessoas vão justificar a compra do MS Office mas sempre serão a exceção. Como ODF é o porto seguro de formato que todo funcionário consegue abrir, o MSO será usado somente em casos especiais. Por solicitação do Diretor de Normalização, Sr. Eugenio Guilherme Tolstoy De Simone, informamos que, após a análise dos comentários dos Srs. Murilo Dantas e Deivi Lopes, a ABNT decidiu solicitar à ISO o cancelamento de todo o processo de elaboração da ISO/IEC DIS 29500 e seu retorno como um novo item de trabalho (NWIP) seguindo o processo normal de elaboração (sem Fast-Track) no âmbito do ISO/IEC/JTC1/SC34. Significa que além de o Brasil ter votado NÃO em todo o processo de normalização do ISO/IEC DIS 29500 (mais conhecido como padronização do OOXML), tivemos também coragem de peitar a ISO e pedir o cancelamento de todo o processo por irregularidades que foram documentadas e enviadas a ISO semanas atrás. Pelo que ouvi falar, isso nunca aconteceu antes em um processo Fast Track. Nunca inclusive houve uma apelação de nenhum país após um BRM antes do OOXML. Mas quatro países apelaram nesse caso. Nunca antes também os processos da ISO foram tão expostos a níveis populares. Foi preciso um desejo de padronização de algo (o OOXML no caso) que tem enormes impactos populares, sociais, tecnológicos, e financeiros para expor esses processos (e a forma como são tocados) para que o mundo perceba como eles podem ser falhos e sucetíveis a opiniões pessoais. Onde só deveria haver espaço para posições independentes, tecnicamente fundamentadas. O OOXML virando padrão ISO ou não (pelo andar da carruagem, não vai virar), o mundo aprendeu uma lição: a ISO precisa mudar. There was an ISO/IEC/JTC1 meeting in Oslo, Norway wednesday and the local community protested against OOXML and demanded more integrity in ISO’s processes. I couldn’t agree more. Photos by Martin Bekkelund. More info on Zak Greant’s blog. I am learning a lot from all this standardization process. I was a member of the brazilian committee and I also analyzed the specification. My country disapproved OOXML and I think this was a decision based on logic lead by the process. In other words, from my understanding, if there is one or more technical problems, the NB must disapprove the DIS. 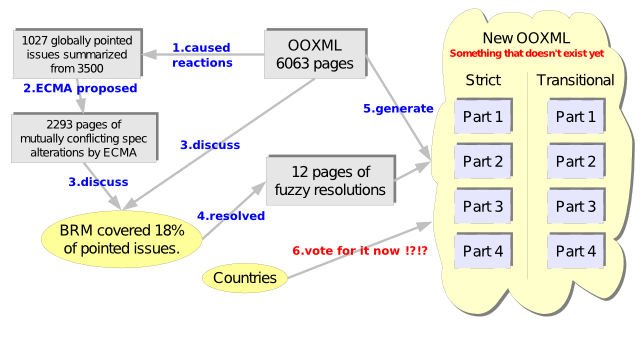 Many countries found many technical problems in OOXML that are still unresolved even after the BRM. I also understand that such an important matter as an International Standard for Office Documents can’t be defined by 10 or 30 opinions collected as votes in a committee. Thats why the JTC1 process above talks about technical content, not opinion or vote. What I learned from studying the OOXML specification is that it is not ready for acceptance since many countries have found and reached consensus that the spec has problems, even after the BRM. If the NB-leveraged technical team — formed by people that would vote YES and NO — has produced a list of submitted problems in the spec, this list is by itself the consensus that the spec is still problematic. I would like to understand why an NB that has produced technical comments voted YES or ABSTAINED. I thought abstention is a position for countries that were not able to create a committee to technically discuss the specification for reasons such as logistics or lack of quorum. I am learning about all this and I’d like to have more solid arguments to build an opinion about these NB’s maturity to run a well documented process. 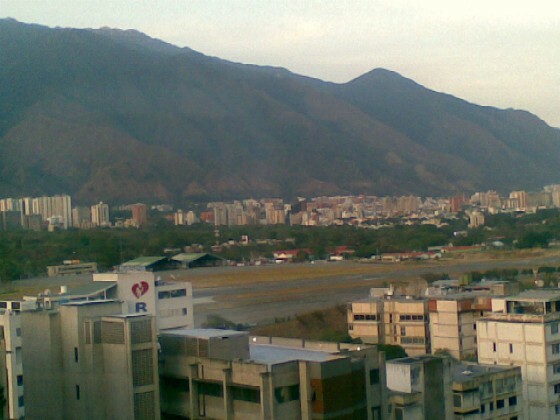 Attached please find a letter from Mrs. María Teresa Saccucci, Standardization Manager of FONDONORMA (Venezuela) through which Venezuela wishes to modify its position on DIS 29500, Information technology – Office Open XML file formats from “Approval with comments” to “Disapproval with comments”. This NO was a result of a very difficult meeting. Consensus was not reached and a lot of confusion happened. Exactly as in the first brazilian NO. The NB had to decide the final vote based on technical issues still open in OOXML. The problem was the method of deciding and those technical points were not presented. So people only had in their head the Microsoft arguments that I already knew were part half trues and part complete lies. I participated in the OOXML process in 3 countries and I was able to build an opinion on how normalization happens today in the world, and I’ll show some ideas in a future post. 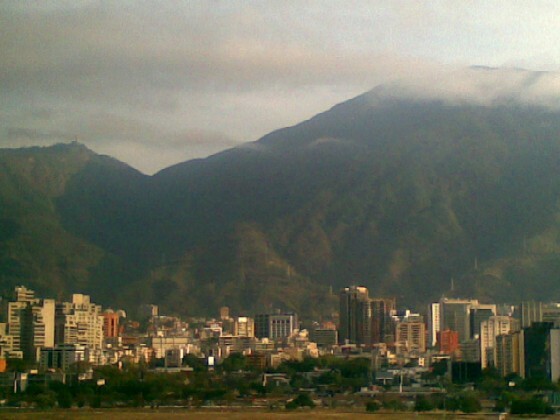 By the way, this is how Caracas looks like, a city surrounded by huge green mountains that have behind them the Caribbean Sea. Open Malasia blog has a user friendly post with a map of the voting. See the tables and understand the voting criterias. OOXML: Brazil Says NO. Again. It is now official. Brazilian vote was decided by consensus of the entire technical team, including Microsoft crew’s: OOXML does not deserve to be an international ISO standard. Our first vote, in august, was also NO, due to the same reasons: OOXML is an awful specification. That outcome was expected because we simply followed the process: technically analyze the OOXML specification, make comments, wait for responses, analyze them and see if all problems were fixed. Is there any single remaining unresolved problem? Vote NO. And in fact there were many many unresolved problems. If every country followed this simple process, OOXML would receive a NO from 100% of them. But in some countries, how is the process? Invite a few companies and simply count their votes. The problem here: 10, 20 or 80 votes can never represent what is the best for that country. Only, maybe, if you collect one vote for each citizen. What I am trying to say is that in this case a decision must be reached by technical consensus, not vote. It is not a matter of will, but a technical issue that can only be reached by rational analysis and deliberation. In Chile for example, 21 voting companies will define a 15 million people country vote in ISO. How easy is to lobby these 21 companies with Power Point presentations telling complete plain lies ? Nobody had time to analyze the OOXML specification and the ABSTENTION was the right choice. Nobody had time to analyze the OOXML specification and a few people decided for you to vote YES, based on ideology or a result of lobby, not technology benefits. Even having time to analyze the OOXML specification, a few people decided for you to vote YES, based on ideology or result of lobby, not technology benefits. Seems stupid, but these are exactly the 2 possibilities of OOXML getting YES votes in ISO. It is still an awful specification. By the way, Brazil would vote NO again and again and again even if all OOXML’s technical issues could be resolved. OOXML would still have legal issues and also serious overlap problems with the OpenDocument Format ISO standard. I was not present in today’s meeting in ABNT because I already knew what would be the result, since the process of analysis and deliberation in Brazil was very strictly followed. Hopefully Jomar will write about it and you can check more details. Microsoft started their so called “interoperability” initiative. With a deeper look we find that the main objective of the released specifications is to let developers interact with their products only, something I like to call Intra-operability. Microsoft technical specifications have serious technical and legal issues, and are being released not to increase interoperability across people, organizations and applications, but to leverage the use of their products. 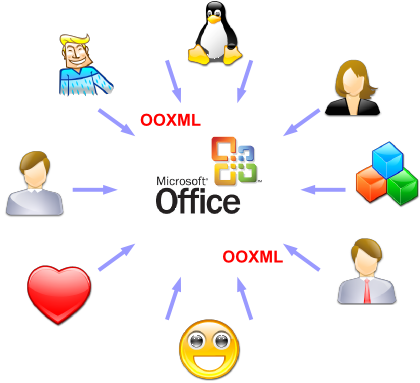 For the standard document format scenario: OOXML is about allowing other people to interact with files that are primarily generated and manipulated with Microsoft Office. It is not about full interoperability, which would enable competition with Microsoft Office, for obvious reason. My friend Cezar Taurion has also written some words about Intra-operability (in portuguese). Bob Sutor also put together some words about it. These graphics are available in a friendly Creative Commons license, in this animated ODF file, in case you want to integrate them in your presentations. PDF export also available. One of the most critical and discussed points of the whole OOXML subject is how the specification lets you include binary proprietary information. So you, as a programmer, please tell me what to do if you are developing an application that must read and generate this kind of document. How can I find documentation about this encoded binary stream? Is this a good practice in XML? Anyway, this kind of (bad) design appears in many parts of the OOXML spec. Want more examples of bad design? Have fun. Suppose I really want to develop this kind of support in my application, I am a master programmer and reverse-engineered a few examples generated with a copy of MS Office 2007 that I had to buy. Or maybe I just found the specification of this proprietary application/x-ms-ink type and go to develop a library to handle it. Inevitably, my library will reimplement aspects of some Microsoft library with same functionality, and according to a Software Freedom Law Center report, the Microsoft Open Specification Promise (OSP, basically the not-open-enough license Microsoft lawyers wrote for the usage and implementation of OOXML) cover’s the specification only, not code. I will be sued for patent infringement. On software rewrite, not on specification usage. Resolution 25: The BRM decides to accept the editing instructions contained in http://www.itscj.ipsj.or.jp/sc34/def/BRM/Response_0135_bitfields.doc in place of R 135, replacing “deprecated” by “transitional”, and with the following addition: The Editor shall ensure that all existing attributes defining the bitfields described above shall be “transitional”—so resolved. Who reads this resolution with high level eyes may think that all binary fields will be removed from the specification. But please, you, as a programmer, tell me how the so called Editor will find all and every single part of a 6000+ pages specification containing bitfields? How he’ll expand all those bitfields in an XML subspecification? Will he invent some? Is he the right person (or team) to do that? When done and if done, the specification will be something completely new, full of new parts. Will jump from 6063 pages to maybe 7500. Oh, and did I mention it will be something that even MS Office 2007 or 2008 don’t support today? Supporting or not, implemented or not, this new unexistent specification is the “thing” that countries’ National Bodies are voting right now, without even seeing it, without checking if it was corrected, without having time for this because they didn’t receive it for revision. They won’t have time to review 6000+ pages because the deadlines defined by the ISO’s Fast Track process are over. So the question is how ISO/IEC and JTC1 let such a big and problematic specification enter the light Fast Track process? My answare: ISO was raped. I’ve been talking to several people that will define their country’s vote and their mindset is “are you really putting ISO in such a bad position?” Well, yes. You know, in the end ISO is not god. They are a bunch of people that, like you and me, have religions, aspirations, problems, family, go to the bathroom etc. Like you and me, they may be also naive in regard to some subjects, particularly document formats. Then comes Microsoft excellent speakers showing PowerPoint charts that are plain lies (e.g. “OpenOffice.org supports OOXML”) and people believes them. People have two choices: to question ISO’s reputation in the OOXML case, or question IBM, Sun, Oracle, Red Hat, Free Software Law Center, ODF Alliance and many other institutions’ reputation when they massively scream in chorus that OOXML has serious technical, legal and standardization process issues. This is a world where organizations like ECMA has completely lost the respect of the technical community. But this is not a big problem, because we have other similar, still reliable bodies as OASIS, W3C, OSF, etc. This is a world where we will have to work hard to make ISO regain its (currently damaged) reliable status. This is a big problem, because we only have one (and only need one) International Standards Organization. This is your responsibility. To start this work get involved with your country’s National Body for standardization and promote the creation of a formal letter to ISO about the OOXML process, its problems and how ISO let that happen. INCITS in USA, ABNT in Brazil, INN in Chile etc. This is an example of an old Excel bug that was transported to OOXML for “compatibility” reasons. In new OOXML, there are several non-standard ways to represent dates. The main one is this, that requires that 1900 is a leap year contradicting the Gregorian calendar, used for centuries now. More info on this in a post by Rob Weir. Li algumas coisas na Internet sobre o resultado final do BRM. Em alguns lugares encontrei números e interpretações das mais diversas sobre estes resultados. Como faço parte do comitê da ABNT que analisou o OOXML, resolvi conversar com o Jomar, que foi um dos delegados brasileiros em Genebra. Ele me disse que não pode comentar nada sobre estes números e sobre o resultado, pois no último dia do BRM, a autoridade da ISO lá presente alertou a todos que nenhum número deveria deixar a sala de reuniões, pois sem conhecer os processos de decisão lá adotados, nenhum número ou estatística faz sentido. clara violação das regras estabelecidas (mas aliás… alguma regra foi seguinda neste processo todo ?). Eu tentei insistir com o assunto (e olha que o cara é meu amigo), mas ele se recusou a me dar mais informações. Me pediu apenas para entrar em contato com quem divulgou as informações e pedir a ele os devidos esclarecimentos (incluíndo os critérios e regras de votação). “Se eu te disser que 85% da população mundial sobreviveu à II Guerra Mundial, você consegue concluir que esta guerra não foi tão ruim assim? Se não consegue é porquê conhece os detalhes do processo. Se consegue… vai ler os livros de história e estudar o processo e aproveite pois este episódio não teve uma “Lei do Silêncio” que obrigou todos os envolvidos a se calar. O BRM não vai ter “livro de história” para explicar a estatística.”. Números são apenas números e marketing será sempre marketing (e o Jomar não abre a boca mesmo… que chato). Segundo o post do Jomar que esteve no BRM da ISO, um cidadão chegou nele num intervalo e sutilmente pediu para que não levantasse uma questão importante no processo do OOXML da Microsoft virar ou não um padrão ISO: a inexistência do mapeamento entre o formato legado (ex: .doc) e o formato novo (ex: .docx). Sem esse mapeamento, o propósito primordial da existência do OOXML como padrão ISO deixa de existir. Os tais “documentos existentes” são no caso todos os documentos em formato binário legado do MS Office (.doc, ,ppt, .xls), algo fora do escopo do OOXML. Se esse mapeamento não fizer parte da especificação OOXML, seu objetivo primordial é inválido. A especificação é inválida. E a delegação brasileira queria levantar essa bola: cadê o mapeamento ? Mas o barraco aqui é outro. Um cidadão pedir pra ele não levantar essa bola é uma coisa. Sei lá, tal cidadão deve ter razões políticas ou financeiras para querer ver uma especificação com sérios problemas conceituais [OOXML] virar um padrão internacional. O que me escapa o entendimento é por que a ISO não deixou o Brasil apresentar esse questionamento ? Só sei que a blogosfera vai desabar sobre esse assunto nos próximos dias e vou acompanhar de perto os blogs do Rob Weir, Bob Sutor, Andy Updegrove, Groklaw e a quantidade de reações que o post traduzido do Jomar recebe. Muitos desses blogs já estão descendo a lenha. A few days ago I saw a post in Google Blog with Google’s position regarding the document format war. The post also provides some short documents with Google’s findings (2 pages) and sample of technical issues unresolved in OOXML (4 pages). This is a fast reading for who wants to understand the main issues of OOXML. Teve um remelexo hoje na indústria de TI quando a Microsoft fez seu anúncio “interoperability by design”. E da promessa de abrir o .NET? Falando nisso, pra que reinventar a roda com .NET quando Java já estava bombando no mercado de desenvolvimento de aplicações comerciais? Simplesmente porque — é o que a história nos mostrou — não está no DNA dessa empresa trabalhar de forma cooperativa, num esquema ganha-ganha. Esse anúncio agente tem que contextualizar no tempo e no espaço. O tempo é 2 dias úteis antes da reunião da ISO que vai decidir o destino do OOXML como padrão. E usuários estão percebendo que seus documentos não são realmente deles e sim do dono da ferramenta que os lê e grava, o que se traduz em indignação. Então o espaço é de aperto, o aperto dos acionistas da Microsoft que pediram mais ética. Da análise técnica do OOXML aprendi que aquilo não foi exatamente “desenhado para interoperabilidade”. As víceras tiveram que ser abertas na marra porque a vantagem do ODF era periclitante. Em face de todos esses fatos do passado, esse anúncio, por enquanto, não passa de marketing. Mas vamos esquecer o passado e ser otimistas. Se a Microsoft realmente estiver a fim de mudar, isso deve ser recebido de braços abertos. A Web nos ensinou que quanto mais gente colaborar melhor ela fica. Não é diferente no mundo dos padrões e tecnologias. Então Microsoft, seus clientes, programadores, concorrentes, comunidade de software livre e o mercado em geral só tem a ganhar se tanto otimismo se pagar. Vou me manter otimista e esperar agora por ações práticas, porque o blablablá nós já ouvimos. E foi ± isso que eu disse na entrevista ao IDG. Essas reuniões do grupo de trabalho da ABNT servem também para encontrar velhos amigos e um deles foi o Penna do Banco do Brasil, um dos responsáveis pela adoção em massa de Linux na empresa. Contou que 100% das agências tem seus servidores rodando Linux. 100% dos caixas de atendimento. E a grande maioria dos PCs de atendimento personalizado. Contou que por volta de 2004 e 2005 tudo rodava sobre OS/2 e havia a necessidade iminente de sair dessa plataforma. Mas grande parte do trabalho de porte das aplicações já havia sido feito em Linux pela equipe técnica. Apesar de terem ainda muitos documentos legados em formatos proprietários, o uso de BrOffice.org é praticamente universal e um departamento precisa ter um motivo que justifique a compra de qualquer outra suite de escritório. Na minha opinião, BrOffice.org é gratuito e bom o suficiente a ponto de o Banco do Brasil (ou qualquer empresa) poder ser chamada de financeiramente irresponsável se não o considerar. A partir daí, como todo funcionário tem BrOffice.org em seu PC mas nem todos tem outra suite paga, o formato de documentos que circula tem que ser algo universal. E há algo mais universal que ODF? Certa vez o Penna me contou também que pegaram um Sharp Zaurus (PDA que roda Linux) e recompilaram as aplicações da agência para rodar nele. Sim, eles montaram uma agência de demonstração com um PDA como seu servidor, só pra mostrar a portabilidade e que é simplesmente possível. What a cute movie about $$ spent with office suites. Ela: Recebemos a ligação de um jornalista da ###### dizendo que a IBM apoia o padrão XML porque os programaa IBM Lotus Quikr , IBM Websphere Portal , IBM DB2 9 XML suportam XML… vc sabe dizer se é verdade ? E se sim, porque fazemos isso ? Eu: XML é um padrão universal de todos… com certeza apoiamos! Mas acho que ele quis dizer “Office OpenXML” da MS.
Ela: isso… quer dizer que estes produtos suportam XML não OPEN XML da MS ? é isso ? entendi certo ? Eu: se “XML” fosse um “meio de transporte genérico”, então “Office OpenXML” seria um “Gol GL 1.6”. Ou seja, tem muita gente trocando as bolas entre XML e OpenXML, especialmente gente que tem acesso a mídia. Roberto Salomon, do BrOffice.org e IBM, faz questão de lembrar quem são os verdadeiros donos dos documentos .doc, .ppt e .xls. O Service Pack 3 do MS Office 2003 simplesmente proibe um usuário abrir versões antigas desses formatos por serem declarados inseguros. Jomar também monta em cima e manda sua letra. Salomon discute muitas coisas interessantes ao redor da guerra de padrões em seu blog. E o mesmo Salomon comenta com citações que o OOXML “é uma simples questão de interesses comerciais”, segundo a Microsoft. E parece que o pessoal de marketing aqui na IBM tem usado a imaginação para mostrar a linha de produtos de colaboração com o lúdico site Complete A Ponte. Fizeram também uns vídeos engraçadinhos. Um dos produtos mais em voga que está lá é o Lotus Symphony, suite de escritório gratuita, compatível com o formato aberto ODF, os proprietários do MS Office (.doc, .xls, .ppt) e também com o formato do antigo Lotus Smart Suite (.lwp, .prz, .123, .wk4). Ou seja, o Symphony pode ser usado para converter tudo isso para o moderno ODF. Mas há outras coisas lá também como o Lotus Connections que traz para o ambiente corporativo o que há de mais atual na Web 2.0, como Wikis, Blogs, tagging e comunidades e redes sociais (a la Orkut). E claro não poderiam ficar de fora o Lotus Domino, servidor de workgroup mais popular do mundo, e outros. Visite e complete a ponte ! Nenhum formato atende a todos os cenários de uso — nem o Open XML certamente — e por isso liberdade de escolha é a melhor saída. Este é o ponto filosófico mais amplo que você parece ignorar. Liberdade de escolha se dá no nível dos produtos e não no dos formatos. Um único formato padrão deve ser adotado para eliminar falta de interoperabilidade. Se ao longo do tempo surgem novas necessidades que o formato não suporta, a sociedade trata de melhorá-lo. E para isso o processo que mantém o formato deve ser aberto. A sociedade não faria isso — não era muito natural — a 15 anos atrás na alvorada da Internet, mas hoje é a prática corrente. Um único formato padrão que obrigatoriamente evolui abertamente. Caso do ODF e que não é o caso do OOXML (porque o OOXML é e sempre será a documentação do que já foi implementado de forma fechada no MS Office). Multitude de ferramentas que suportam, geram e consomem este formato. Caso do ODF, OpenOffice.org, BrOffice.org, Symphony, Abiword, GNumeric, KOffice, Corel Office, etc etc etc; e que não é o caso do OOXML e MS Office. Claro que alguém pode escolher formatos não-padrão-aberto e suas ferramentas proprietárias por alguma razão técnica ou psicológica não resolvida. Isso também é liberdade. Mas em 2007 já somos bem grandinhos para saber que a longo prazo isso vai lhe trazer falta de interoperabilidade, amarrações comerciais e preços inflexiveis por conseqüência. Ia a um grande hipermercado na região da avenida Pacaembú em São Paulo quando me deparei com essa loja de Internet no estacionamento. A palavra “compatíveis” me chamou a atenção. 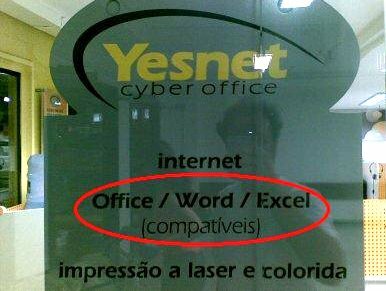 — Companheiro, o que é esse Word compatível ? — Tá, mas qual é o nome desse programa? — É um que chama BrOffice. Se um cybercafé — que ganha a vida só com esse tipo de serviço — pode ser independente o suficiente a ponto de usar somente BrOffice, qualquer um também pode. Você, usuário de alguma suite de escritório paga, te desafio a usar BrOffice.org, Symphony, Lotus Notes 8 ou qualquer outra suite baseada no OpenOffice.org por duas semanas e ver como se sai. This is a reply to David Nielsen’s “OOXML and Microsoft” post. Since comments are closed there, I am writing here. There is already an approved, open, internationally standardized spec for office documents: ODF. So OOXML can be another spec, but can’t be another standard spec for the same purpose. The standardization push is not welcome. It is simply too late, amongst other issues. Microsoft opened their spec not because they wanted, but because they needed to, after ODF acceptance as the ISO standard. If Microsoft will be successful in its anti-ODF campaign, they won’t need this openness status any more and I bet OOXML v2 will be closed. To your last point, it’s hard for Microsoft to commit to what comes out of Ecma in the coming years, because we don’t know what direction they will take the formats. We’ll of course stay active and propose changes based on where we want to go with Office 14. At the end of the day though, the other Ecma members could decide to take the spec in a completely different direction. Microsoft is trying to fool everybody saying that OOXML is different from ODF. ODF is “a standard for office documents” while OOXML claims to be “a standard for office documents and compatibility with legacy office file formats”, just to not have a 100% overlap. But the “compatibility” part makes no sense because OOXML is textual XML and the legacy formats are binary. OOXML and legacy .doc, .xls, .ppt may have similar organization or structure but is impossible to be “compatible”. But even if OOXML wants to have a relation with legacy, the spec is incomplete and does not provide a mapping like “this OOXML tag is related to that stream of binary bytes in the legacy format”. In the National Bodies meetings to discuss OOXML standardization we proposed to include this mapping (then legacy .doc would become a truly open spec), or remove the compatibility statement from the spec title. If removed, OOXML would still be a beautiful spec, but could not be accepted as an ISO standards because of its full overlapping with ODF. OOXML reinvents the wheel and has many obscure parts. As a specification, currently OOXML doesn’t have a quality grade to be a standard. ODF está hoje para as aplicações de escritório como o HTML estava em 1995 para o browser… é só o começo. Assim profetizou Jomar Silva, diretor da ODF Alliance Brasil, enquanto me mostrava um rescunho da tradução da especificação para português. Que, diga-se de passagem, está ficando ótima. A ODF Alliance Brasil, junto com a comunidade técnica IBM developerWorks, mais a Linux Magazine lançaram o concurso Padrão Aberto, Prêmio Certo! Basta contar sua história de sucesso no uso do formato OpenDocument em um artigo. Todos que participarem ganham brindes de Linux, e o melhor artigo será publicado na Linux Magazine, de circulação nacional. Mais informações no site da ODF Alliance Brasil. Today in the news, IBM joins the OpenOffice.org community to develop and promote OpenOffice.org technology. IBM was already supporting the OpenDocument Format. Jomar Silva from the ODF Alliance Brasil, provided a link to all reports received by ISO regarding the OOXML process. Jordanian report (J1N8726-27.doc) is just hilarious. Even with 44 pages of technical comments (J1N8726-04.doc), US approved OOXML. Spain’s single comment (J1N8726-02.doc) shows a situation almost lived in Brazil too: “There is no possible to get the necessary consensus in the mirrow comitte to support either of the other positions”.